This Project as collaborative work with other institutes aims at the further evaluation of a new high specific antibody, thereby accelerating its approvement. For this purpose, the antibody is radiolabeled and used in in vitro and in vivo studies. 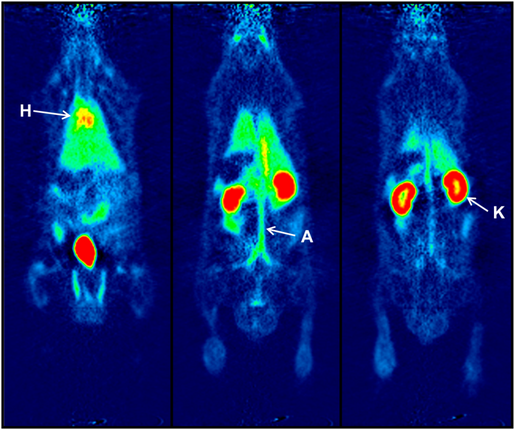 We will use short-lived Isotopes (68Ga-Gallium) and relatively long-lived isotopes (90Nb-Niobum) to examine the in vivo accumulation of the labeled antibody via bio distribution and PET (positron emission tomography) studies. In this way we will be able to approve or verify the excellent specificity and accumulation kinetics. Moreover, fragments of this antibody will also being examined for the same parameters. Finally we hope to adapt the targeting of this antibody to smaller molecules like mikroproteins (knottins), which, beside their smaller mass, have nice advantages in contrast to an antibody. Due to rapid metabolism or excretion most of the classic pharmaceuticals only have a short retention time in the bloodstream. As a result the uptake into target tissue is reduced and in order to reach the desired effect, the dose needs to be increased. The retention time of nano-sized particles in the bloodstream is raised because of their bigger size. This leads to an advantage in the uptake into target tissue. Furthermore the EPR effect (EPR: enhanced permeability and retention) ­ which is based on increased permeability of blood vessels and decreased lymphatic drainage ­ in tumor tissue can be used. Since the biodistribution of such systems is depending on the properties of the macromolecule, it is the purpose of this study to exactly determine these dependencies and to synthesize molecules with the desired properties. To illustrate the distribution of different polymeric and nano-sized systems positron-emission-tomography (PET) as an imaging technique is used (cf. figure). Depending on the desired timescale of the study, the macromolecules are labeled with radionuclides like fluorine-18 or radio iodine isotopes. copolymer 2 h post injection; H: heart, A: aorta, K: kidney). Bone metastases are a serious complication for patients suffering from cancer. Early diagnosis and localization is crucial to the treatment of patients. In the clinical routine this is performed with planar imaging or single photon emission computed tomography (SPECT) using established 99mTc-phosphonates as radiopharmaceuticals The aim of this study is the synthesis of new macrocyclic bisphosphonates, which have a high affinity for bone substance and can be labeled with both 68Ga-gallium for the diagnosis using PET and with 177Lu-lutetium for the therapy. Due to the short range of its β--radiation 177Lu-lutetium is especially well suited for such a tumor therapy. Fig: Whole body PET-scan of [68Ga]BPPED during 120 min.